Improve the functionality and look of your home with remodeling services from On The Level Contracting. On The Level Contracting began as a family owned small business and was established by George & Georgia, husband and wife, in 1995. Built on the foundations of customer satisfaction and high-quality service, On The Level Contracting’s focus is to create a relationship not as a customer, but as part of the OTL Family! In 1996 On The Level Contracting became an exclusive service provider for The Home Depot. 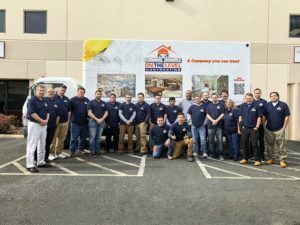 We started working with Home Depot solely with the door installation program, and through many successful years, we have expanded our installation programs to include kitchen & bathrooms for The Home Depot. Serving the Virginia, Maryland, Pennsylvania, West Virginia, and DC areas, we have helped families complete their projects and build their dreams, and we are grateful for the relationships we have maintained over the years. Just as you have your doctor, your dentist, your lawyer… we want to be YOUR contractor. We aim to ensure that you are delighted with our work so that any time you want to make home improvements, you come right back to us. With our expert teams of experienced, licensed, and insured professionals, there is no project too small or too large for your residential needs. Let us prove to you why On the Level can be both your first and last call for your project needs. We have serviced over 100,000 satisfied customers, and the list just keeps on growing. Contact us to get started on your next home improvement project today! We can provide a FREE in-home consultation. Check out our Gallery to see project we have completed and get ideas for your own project. © 2017 On The Level Contracting. All Rights Reserved.